Because I was so impressed by her Shatter Me series, Tahereh Mafi is one of my favourite authors. She has a vibrant, lyrical writing style that always wows me! Thus, when I heard that she was releasing Furthermore, I was exuberant to read it, and I was even more excited when I was FINALLY able to get my hands onto it! Though I often am not a huge fan of middle grade fantasy, or fantasy in general, Furthermore opened many new doors for me to try more books of this type. As I expected, I really enjoyed reading this one- its writing, characters, and plot were all top notch! Basically, this novel follows the perspective of a young girl named Alice who lives in a land called Ferenwood. She was born without colour and magic in her, which makes her a little bit different from others. Upon the escape of her father from her homeland, Alice is forced to take a journey through the mysterious land of Furthermore alongside a boy named Oliver whom she is not particularly fond of. Will she get her colour and magic and find her father? And will she learn to get along with Oliver? I liked both of the characters in this story for sure. Personally, I preferred Alice over Oliver because of her bravery, perseverance, ability to be a role model, and wisdom, but Oliver comes as a close second because of his immense character development throughout the book. They were both adorably innocent at times, and I loved that for a change. Plus, I loved how their relationship grew for the better as the story progressed! I thought that this book had quite the unique flair to it, but I honestly can’t say much because I don’t read a lot of fantasy. 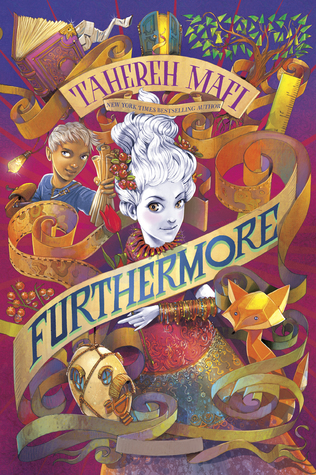 However, I absolutely did find myself amused and captivated by all of this story’s happenings and I just want to read more from the land of Furthermore! Overall, I had a splendid time cuddled up with this book. I really appreciated this novel’s main characters, storyline, as well as Mafi’s awesome writing style that was the delicious cherry on top of it all! I would recommend Furthermore to readers who enjoy fairy tales, magic, and simply anything to do with light, happy fantasy books. Tahereh Mafi never disappoints! I have only read this book, by her and I enjoyed it, can’t wait for Whichwood now. I think I will!! I can just tell sometimes, you know?